Last week, I participated in Bout of Books. 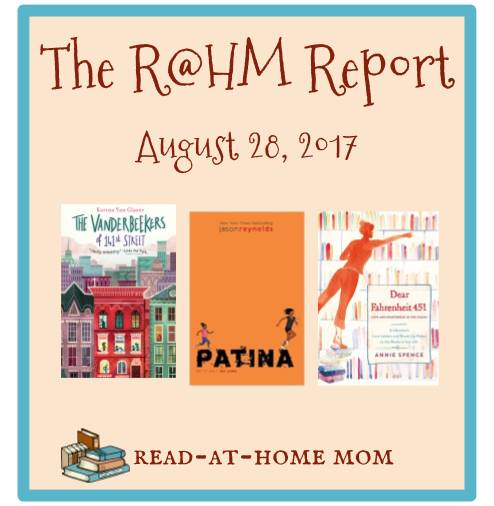 Today's post rounds up everything I read during the 7-day read-a-thon, plus what I'll be reading next! This series never disappoints. This one struck me as especially funny. This is another of those introspective and descriptive short novels of which MacLachlan has written so many. It was well-written, but not my favorite of hers. I was really curious about this first novel by board book and picture book author/illustrator Leslie Patricelli. I was pleasantly surprised by how refreshing and different it was. I enjoyed this graphic novel as much as the first one, but it felt short to me. I could have read 100 pages more at least. This was a fun diversion for a former librarian. I liked the letters, but not so much the book lists in the second half of the book. The voice in this one is not as strong as that of the main character in Ghost, but otherwise it was everything I wanted the second book of the series to be. I am reading ahead a little bit for the Old School Kidlit Reading Challenge, which will focus on school stories in September. This was a sweet story about a mischievous Appalachian boy's first experience with school. I loved the writing style. I also read this for the Old School Kidlit Challenge. I would have loved it as a kid because I didn't ride the bus and was always curious about what it was like. This heartwarming family story set over Christmas is reminiscent of kids' novels of the 50s and 60s as well as the Penderwicks series. This one's not even out yet and I'm already eager for the sequel, which is due out in 2018. I told myself I was going to read all 8 volumes of this set, and I'm regretting that decision a little bit. There were a lot of names in this, and I found it hard to retain any information. I did like the treatment of Biblical history, however. I enjoyed this book differently this time than I did as a teenager. I'll have a lot to say in my review. I ended the read-a-thon with this quick read. I'm hoping to finish the series and review it for the Old School Kidlit Reading Challenge as well. I made some good progress on this book this week, but since I save it to read at night, it's always going to be a slower read than the others. I may try to finish it this week, but I make no guarantees. I barely touched this all week. It's on my phone so I can sneak in a chapter here and there, but it's quicker and more satisfying to read kids' books, especially during a read-a-thon. I am loving this, but it's a long one. I'm about a third of the way through. I just borrowed this from Open Library since it comes right after Beware the Fish and I'm trying to get through the rest of the series. I've only read the first page so far. I'll be linking up today with Bout of Books to report on my progress for the last time, and with Unleashing Readers/Teach Mentor Texts and Book Date for It's Monday! What Are You Reading? Patina and Ghosts of Greenglass House are both on my wishlist. Come see what I'm reading. I'm curious about The Vanderbeekers...and Butternut Summer. What a fabulous collection of books! Eugenia Lincoln and the Unexpected Package is one I will look forward to since I loved Where Are You Going, Baby Lincoln? I finished Patina this week and loved it. Dear Fahrenheit 451: A Librarian's Love Letters and Break-Up Notes to the Books in Her Life sounds like another one I will love. I was such a massive Gordon Korman fan as a kid - he is a Canadian treasure! I really enjoy this series from Reynolds - Ghost and Patina. Really pleased that these are for a MG audience. I just bought Patina today and am eager to get started. I am also looking forward to Swing it Sunny. You have some great titles here.